Date: Sunday, April 20th – Easter Sunday! Genevieve letting me listen to the sounds of a Pilot Whale and explaining how the acoustics technology works. As I explained in an earlier blog, all the scientist on the ship are here because of the Atlantic Marine Assessment Program for Protected Species, or AMAPPS for short. A multi-year project that has a large number of scientists from a variety of organizations whose main goal is “to document the relationship between the distribution and abundance of cetaceans, sea turtles and sea birds with the study area relative to their physical and biological environment.” So far I have shared with you some of the Oceanography and Marine Mammal Observing. Today I am going introduce you to our Marine Mammal Passive Acoustics team and some of their cool acoustic science. The two acoustic missions of the team are putting out 10 bottom mounted recorders called MARUs or Marine Autonomous Recording Units and towing behind the ship multiple underwater microphones called a Hydrophone Array to listen to the animals that are as much as 5 miles away from the ship. The two different recording devices target two different main groups of whales. The MARU records low frequency sounds from a group of whales called Mysticetes or baleen whales: for example, Right Whales, and Humpback Whales. Once the the MARU has been programmed and deployed, it will stay out on the bottom of the ocean collecting sounds continuously for up to six months before the scientist will go retrieve the unit and get the data back. The towed Hydrophone Array is recording higher frequency sounds made by Odontocetes or toothed whales like dolphins and sperm whales. 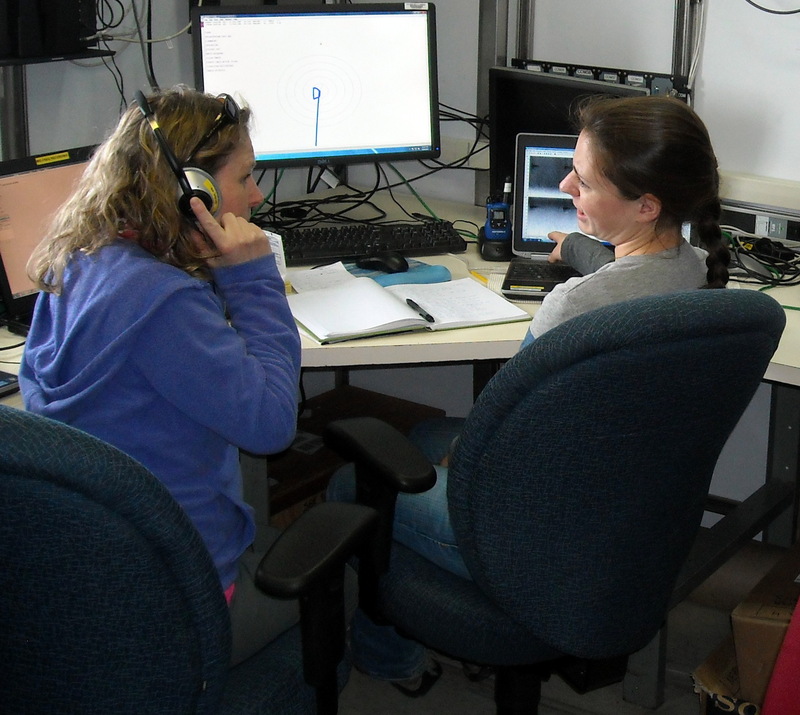 The acoustic team listens to recordings and compares them with the visual teams sighting, with a goal of getting additional information about what kind and how many of the species are close to ship. Even though the acoustic team works while the visual team is working during the day, as long as there is deep enough water, they can also use their equipment in poor weather and at night. Here are Chris and Genevieve preparing to deploy the MARU. 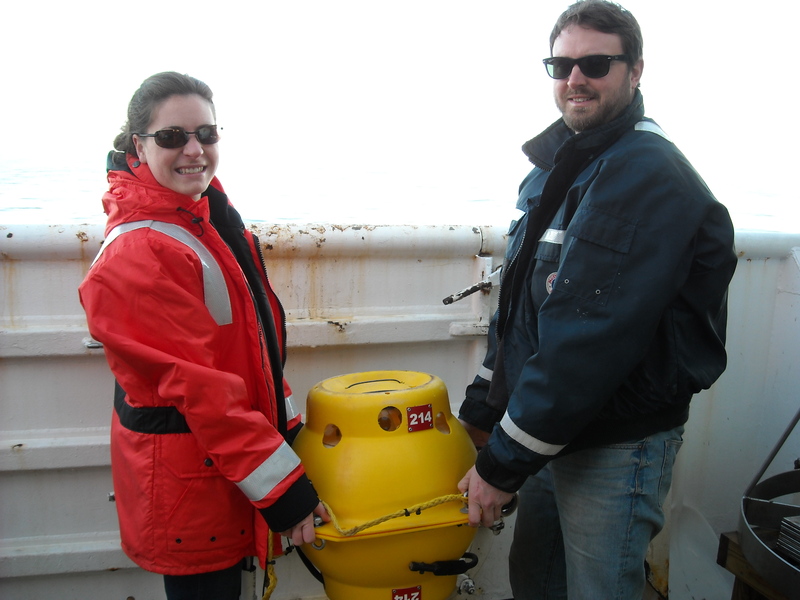 Science Spot Light: The two Acoustic team members we have on the Gordon Gunter are Genevieve Davis and Chris Tremblay. Genevieve works at Northeast Fisheries Science Center (NEFSC) doing Passive Acoustic research focusing on Baleen Whales. She has worked there 2 and a half years after spending 10 weeks as a NOAA Hollings Intern. Genevieve graduated from Binghamton University in New York. She is planning on starting her masters project looking at the North Atlantic Right Whale migration paths. I have been been very lucky to have Genevieve as my roommate here on the ship and have gotten to know her very well. Chris is a freelance Marine Biologist. Chris recently helped develop the Listen for Whales Website and the Right Whale Listening Network. He also worked for Cornell University for 7 years focusing on Marine Bioacoustics. Chris is also the station manger at Mount Desert Rock Marine Research Station run by the College of the Atlantic in Maine. He actually lives on a sail boat he keeps in Belfast, Maine. Chris also intends of attending graduate school looking at Fin Whale behavior and acoustic activity. This is Genevieve programing one of the MARUs getting it ready to go into the ocean. This is the MARU. It is attached to 90 lbs of weight to sink it to the bottom. It will detach from these weights when the scientist send a signal and “pop up” to the surface. This is Genevieve turning on the satellite tag on the MARU before it goes in the water. Chris and Genevieve deploying the first MARU in 6-8 foot seas! This is a close-up of towed hydrophone array which is an oil filled tube with a set of 8 hydrophones in it. The hydrophone array is stored on a winch which is used to bring it on and off the ship. So while most adults were worrying about their taxes on April 15th, I was having fun decorating and deploying Drifter Buoys. Before I left for my trip Jerry Prezioso had sent me an email letting me know that two Drifter Buoys would be available for me to send out to sea during my time on the ship. Drifter buoys allow scientists to collect observations on earth’s various ocean currents while also collecting data on sea surface temperature, atmospheric pressure, as well as winds and salinity. The scientists use this to help them with short term climate predictions, as well as climate research and monitoring. He explained that traditionally when teachers deploy the buoys, they will decorate them with items they bring from home and that we would be able to track where they go and the data they collect for 400 days! The day before I left, I had my students and my daughter’s class decorate a box of sticky labels for me to stick all over the two Drifter Buoys. I spent the morning of the 15th making a mess on the lab floor peeling and sticking all of the decorations onto each of the buoys. Around mid-day we were at our most south eastern point, which would be the best place to send the buoys out to sea. Jerry and I worked together to throw the buoys off the side of the ship, as close together as we could get them. A few days later we heard from some folks at NOAA that the buoys were turned on and floating in the direction we wanted them too. If you would like to track the buoys I deployed, visit the site below and follow the preceding directions. <http://www.aoml.noaa.gov/phod/trinanes/xbt.html> for near real time GTS data. From the site, select “GTS buoys” in the pull-down menu at the top left. Enter the WMO number (please see below) into the “Call Sign” box at the top right. Then, select your desired latitude and longitude values, or use the map below to zoom into the area of interest. You can also select the dates of interest and determine whether you’d like graphics (map) or data at the bottom right. Once you’ve entered these fields, hit the “GO!” button at the bottom. Shortly thereafter, either a map of drifter tracks or data will appear. The two Drifter Buoys all decorated with the cool stickers my biology students and my daughter’s class made. Me decorating the Drifter Buoys with the student’s stickers on the lab floor. Sending the second Drifter Buoy over the side of the ship. There they go! The Drifter Buoys have been set off to catch the currents! Getting ready to deploy the first Drifter Buoy. Jerry Prezioso and I carrying the Drifter Buoys out to the deck. This entry was posted in 2014, Kimberly Gogan, NOAA Fisheries Service, NOAA Teacher at Sea and tagged acoustics, Atlantic Ocean, drifter buoys, hydrophone array, Marine Bioacoustics, MARU, Mysticetes, NEFSC), NOAA, Odontocetes, teacher at sea, whale sounds. Bookmark the permalink.